Three years ago, a seemingly ordinary comedy was released about a girl a cappella group. Most didn't even give this film a second thought when they saw the previews. Then word of mouth happened, and what was a little October release became the weirdly funny yet super charming movie everyone had to see. 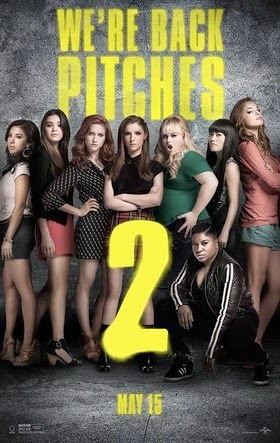 Of course, I'm talking about Pitch Perfect. Fast forward to now, and we're getting the much anticipated if not slightly worrisome sequel. Films can strike comedy gold once, but striking it twice? Is it possible for Pitch Perfect 2 to capture the same charm and hilarity of its predecessor. We catch up with our favorite girl group, the Bellas, and our old friends are all still there, Becca (Kendrick), Fat Amy (Wilson), and Chloe (Snow). The Bellas have been unstoppable for the past three years, and even get to perform in front of the POTUS on his birthday at Lincoln Center. However, a wardrobe mishap with Fat Amy leads the group to be suspended from the International Championship of Collegiate A Capella (yes, that's a real thing). The Bellas have an automatic invitation to the world competition to represent America since they're the reigning ICCA champ, if they can win, which no American team has ever done, then they're allowed back into the ICCA. But that means they must defeat the powerhouse German team, Das Sound Machine, who are the reigning champions. While you would guess the film focuses on the world competition, there's really more of a focus on these girls and the future looming over them. Becca has landed an internship at a record label run by the hilarious Keegan-Michael Key, who pretty much steals every scene he's in. As Becca learns the ins and outs of the record business, she's torn with spending too much time there and not enough time helping the Bellas prepare for world. It's a battle many college seniors face. She's ready to graduate and begin her career, but there's this underlying fear of stepping out into the real world and become an adult. It's easy to fall back on familiarity and stay in college where it's safe, which is why Chloe has failed Russian Lit. three times. She's too afraid to leave her comfort zone of the Bellas. The film really shines when it focuses on the girls' struggle with college ending and beginning adulthood. Director Elizabeth Banks is the perfect person to focus on this strange sisterhood, and how they support each other through all of their endeavors over the years. Even though it's been three years since we've seen them, their relationships have grown, and they feel closer as a group. The plot is fairly straight forward, and it's very obvious how the story will end. However, we're not watching this movie for its plot. We watch for the characters. This film take the time to develop more of the characters. We get more of Amy and Bumper (DeVine), newcomer Emily (played by the surprisingly hilarious Steinfeld), and Becca and Chloe as the try to conquer their fear of adulthood. However, with all the great character development we get, there's also many characters who are thrown to the waste side. Becca's boyfriend Jesse (Astin) may as well not be in the film with as little as he's given. Also, some favorite side characters who don't get a lot of love are Angel-Rose and Lilly. They're just static characters with one-off lines and no arc. There's also more of aca-commentators Gail (Banks) and John (Higgins). While they provided the perfect amount of awkward comedy in the first film, they're used too much here, and the jokes get old really quickly. They should be used as seasoning, but here they're splattered on the main dish which ruins their charm. Also, there's a new Bella who's a walking stereotype which bordered on offensive with everyone joke she said. She's Hispanic and literally made a joke about almost being sold for a chicken as a child. That's not smart comedy. Even with a simple plot and some character problems, this sequel was able to capture the charm of the first film while expanded on the main characters we connected with. Having these girls go through the struggle of graduating from college is a situation many of us can relate to, and the scenes where it's just the girls finding themselves again and bonding as a group are some of the best in the film. The music is fun as always with an even better "battle" than the first film. For fans of the first film, this is a satisfying sequel. If, for some odd reason, you decide to see this film without seeing the first, you won't be lost, but many of the moments, callbacks, and cameos won't feel as special.